In my last entry I attempted to catch up on posting about my projects for 2009 through November. Anyway - in this post I'll cover all the sewing projects I finished for Christmas gifts. Usually I prefer to write about one project per posting, so I can note specific details about the materials used in a project or the particular challenges encountered, but since I worked on these nearly 5 months ago, I'm combining them in one posting. There are a lot of photos in this entry, but I've tried use a few of the best shots for each item. There are more photos of all of these projects in my 2009 Sewing & Crafting Set on Flickr. About a month before the kitchen remodel was scheduled to begin, a good amount of my time was split between packing boxes of dishes and food and setting up the temporary kitchen in the basement and organizing my sewing area, pre-washing, cutting and organizing as many sewing projects as possible. While the guys were downstairs tearing down walls and reconstructing my kitchen, I was upstairs sewing and keeping Keli and Penny out of their way. 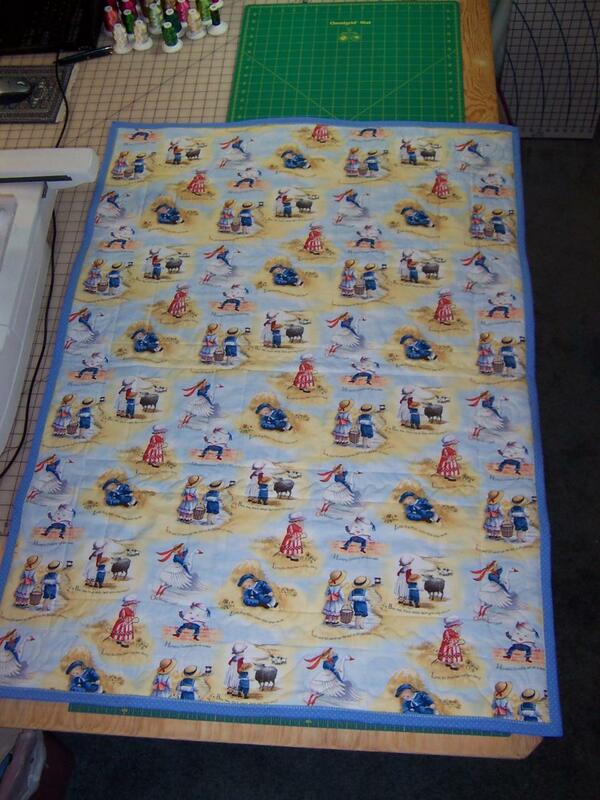 The panels, yellow humpty dumpty and blue sashing fabrics were all purchased at The Cozy Quilt Shoppe. Later, I found the humpty dumpty design on a blue background at one of the quilt shows. The backing fabric has the nursery rhymes all over (Faye Whittaker for Elizabeth's Studio pattern #1444). I used Nature-Fil bamboo batting from Fairfield on this and on Ryan's Cars quilt; it's made with 50% bamboo fiber and 50% organic cotton batting. Before assembling the quilt, I prewashed and dried the batting. For quilting, I stitched in the ditch using a matching thread around each block and along the sashing and borders. It didn't look finished so I added some wavy lines using Superior Threads' King Tut #986-Alexandria on the horizontal sashing. For the outer border, I searched through the motifs in Follow The Lines Quilting Designs, Volume 2 before finding this design, called Deviled Eggs, which seemed appropriate. I traced the design onto Sulky Solvy, used temporary adhesive spray to fix it to the quilt, then set up the Fab-U-Motion for some semi-free motion quilting. Some areas are smoother than others, but overall, it turned out pretty well and it was fun. But I definitely need much more practice. The quilt binding is sewn on by machine using a blanket stitch and the King Tut variegated thread. For the matching soft book, I used each one of the fabric panels padded with leftover pieces of fusible batting and some scraps of the humpty dumpty fabrics for backing. I ended up with 3 finished page layers that were sewn down the center spine (I omitted some of the batting in that area to reduce the bulk a tiny bit). The next project is my nephew Ryan's Cars Quilt. Actually, I worked on this one first, but it was less complicated to piece and quilt than RJ's quilt. I had a bunch of Cars fabrics left over from a quilt I made for my nephew, William back in 2007 and since Ryan is such a fan of Lightning McQueen, I thought this would be a good stash-busting project. The quilt design is from BH&G's Quilts and More magazine, Winter 2008 issue. The pattern is a simple design of 10 inch squares arranged in 6 rows and 6 columns. I used the same design for my niece Lauren's purple quilt last summer (I wrote about that one here). I didn't have quite enough of the Cars fabrics to make all 36 squares, so I filled in with prints of vintage Corvettes and other cool cars from JoAnn Fabrics. 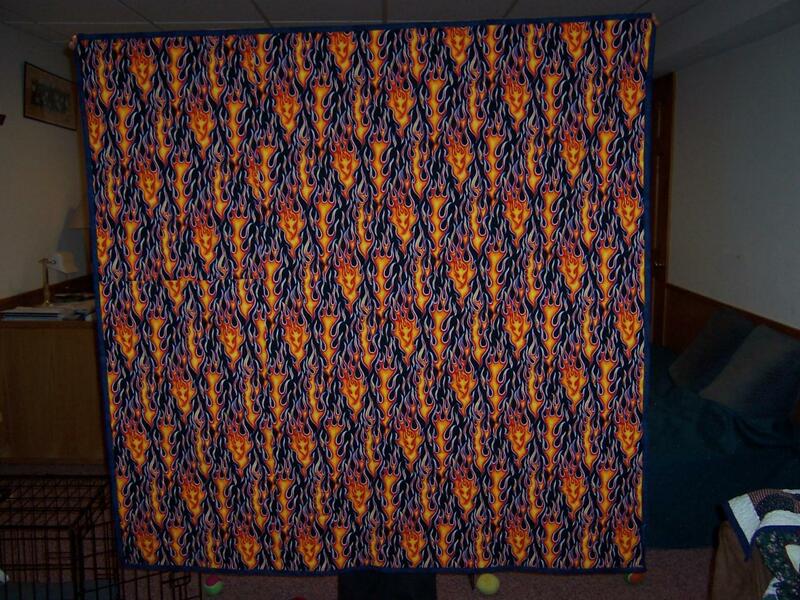 The backing fabric is all flames and reminds me of Hot Wheels. This one was quilted simply in long diagonal lines across the blocks. Lauren's Pillow Sham is based on a similar purchased pillow sham and was another stash-busting project. I used scraps of purple fabrics left over from her purple quilt (see a slideshow of it here), made for her birthday last summer. 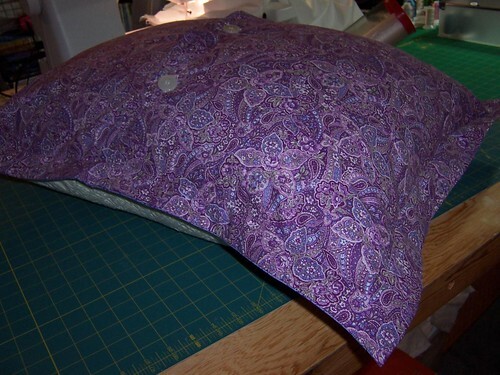 The front of the sham is cut from a remnant piece of matelasse and the purple fabrics were pieced in a scrappy border. The back was made of a single fabric with button closures. Of course, the pillow sham needed a coordinating personalized pillow case. I don't think Lauren could ever get too much purple. And last, but not least, this in-the-hoop gift bag was a quickie and contained some chocolates, a gift card and an IOU, since I had run out of time. The embroidery designs for the poinsettia and bag are both from Embroidery Library. I used a blank gift bag design combined with Positively Poinsettia from A Wispy Wonders Christmas design pack. The fabric is a metallic cotton from my stash. Now we're caught up through the end of 2009; I have a few new projects for 2010 to share, but those will have to wait for another day.